PoC is a courageous film for Mel Gibson – a personal passion project which demonstrated his uninhibited and highly devout devotion to orthodox Catholicism. It was also a near career suicidal move, much like Tom Cruise’s outward representation of scientology, the public exhaltation of religion is tantamount to audience alientation. The film could have failed miserably and been seen as a evangelical schlock of those 'Left Behind'/Kirk Cameron films, but its impossible to ignore because its actually really good. Gibson's cinematic command of the medium is so strong he practically strangles the audience into submission. There’s no more famous story of torture than the crucifixion. The excruciating pain Jesus went through in the name of everyone else’s sin is the basis for Christianity and thus most of the fundamental values of the world today. Whether you believe Jesus was the son of God, blah blah blah, doesn't discount the fact that someone voluntarily went through such terrible agony. Ouch. Nor the fact that this act snowballed into the most significant global phenomenon the world has ever known - Christianity. It’s a tough film to take and Gibson revels in showing us every grisly bit of flesh-tearing over the 2 hours. The procedural and systematic nature of the violence contributes to this. 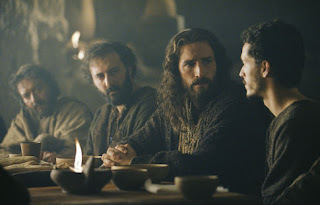 There is no escape for the Jesus, nor the audience, but its so well shot and acted with amazing ferocity, it becomes a great work of expressive art above exploitation. So what if the film has a biased Catholic agenda. So what if Mel Gibson is an anti-semite, womanizing, boozing zealot. Through history some of the great works of art have been made by insane irresponsible people. The last thing we want from our artists is appeasement. People might be scared of Passion of the Christ mere because it’s overtly religious. Any more religious than Ben Hur or ‘The Ten Commandments”. No. In fact, throughout history great works of art have been made about the crucifixion itself. Gibson has even said his lighting scheme with Caleb Deschannel was influenced by the paintings of Caravaggio which were particularly brutal. The best companion piece to Gibson's film is perhaps his main influence Carl Dreyer's 'The Passion of Joan of Ark'. Like PoC, Joan of Ark tells the systematic trial, torture and execution of another zealot, claiming to hear the word of God speak to them. While Dreyer's saves us the gory details of the torture, the procedural nature of that film, is echoed in Gibson's treatment. 'Passion of Joan of Ark' is a landmark film, years later Gibson's film might just emerge to have the same reverence. i think enough time has come for people to forget about all the controversy and view this movie for what it is.